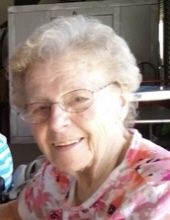 Dorothy “Dottie” C. (nee Maschefzky) Martin, 90, passed away peacefully at her home, on Tuesday, January 22, 2019 with her loving family by her side. She was born in Newark, NJ and was a resident of the Ironbound Section for 86 years. Dottie worked for IBW of Newark for 12 years. She was a lifelong parishioner of St. Benedict’s Church, Newark, where she helped refurbish statues at the Church, was a reader and helped with bingo and the school library. Wife of the late Leo P. Martin; devoted and loving mother of Leo Martin and his wife Kathy, Daniel Martin and his wife Janice, Michael Martin, Barbara Sookraj, Kenneth Martin and his wife Barbara, Janet Martin-Dlugosz, John Martin and his wife Valeria. Also survived by 11 grandchildren and 7 great-grandchildren. The Funeral for Dorothy will be Friday, January 25, 2019 at 8:30 am at the Rucki-Bernauer (Buyus) Funeral Home, 426 Lafayette Street at Wilson Avenue, Newark, NJ. Thence to St. Benedict’s Church, Newark, where at 9:30 am the Funeral Mass will be offered. Interment to follow at Holy Cross Cemetery, North Arlington, NJ. Relatives and friends are welcome to attend. Visitation for Dorothy will be on Thursday, January 24th, from 6-9 pm. In lieu of flowers, donations to the Holy Redeemer Hospice 1228 Route 37 West Toms River, NJ 08755 would be graciously appreciated. To send flowers or a remembrance gift to the family of Dorothy C. Martin, please visit our Tribute Store. "Email Address" would like to share the life celebration of Dorothy C. Martin. Click on the "link" to go to share a favorite memory or leave a condolence message for the family.